After less than 4 hours sleep my alarm awoke me at 3.45am – the time I needed to get up in order to drive to Carl’s house for our 5.45am start. I’d packed the night before so, bleary eyed, I zipped up my suit case, made myself a hot drink for the journey and set off for Carl’s house. About 20-30 minutes into the journey I passed the airport we were due to be arriving at three hours later that morning – annoyingly I had to sacrifice three hours of sleep in favour of 180 miles of driving (100 miles to Carl’s house, then 80 miles back to the airport) so that my car would be waiting for me on our return, when we’d fly into a different airport close to Carl’s house. On my long drive to Carl’s house I took the opportunity to listen to the new Transatlantic album – a fantastic album that I stupidly turned the opportunity to contribute finger clicks to! A couple of months ago, on the first of two Neal Morse shows supporting Dream Theater, Mike Portnoy and Neal took some time before the gig to record Mike’s vocal parts. At one point Neal and Mike came into our dressing room to ask who could do ‘finger snaps’ on with both hands – to my regret, I said that I wasn’t great at them, so three others from the dressing went and recorded them. Later one of the finger snappers confided that they couldn’t really click their fingers, but they just wanted to be on the album – damn my honesty! Except for being briefly awoken by the offer of a cheese sandwich (which I accepted and saved for later) I slept for most of the flight. When we arrived in Budapest we were met by the promoter of the evening’s gig – Bogdan. We’ve played a number of times in Budapest and Bogdan has always been our promoter; we’ve become friends over the years, so it was nice to see him. We were expecting to be met by our soundman, Gabrielli, but Bogdan explained that our agency’s van needed a new water pump and so he’d come to pick us up instead (all par for the course in touring!). Apparently Gabrielli had driven from Rome to Budapest having to stop every 20km to fill the radiator with water… a long drive made unimaginably longer! When Bogdan saw the amount of luggage we had he said that he was going to have to send some of us in a taxi. 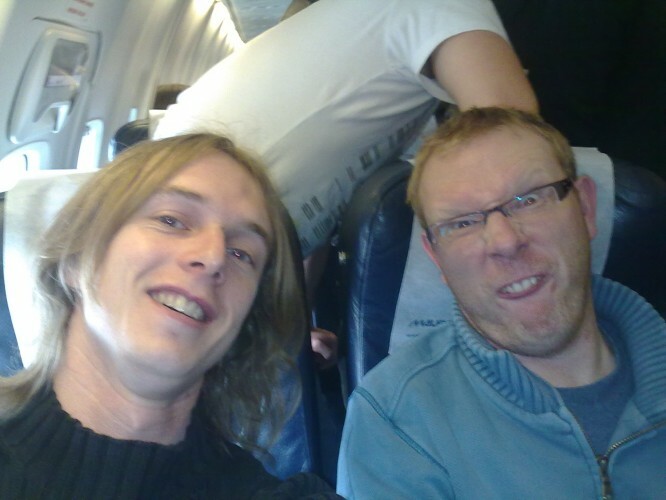 So he ordered a taxi, told the driver where to take us, and Stuart and myself got in and made our way to the hotel while Bogdan drove there in his car with Carl. Our taxi driver drove at an unbelievable speed through the suburbs of Budapest and got us to the hotel in about 15 minutes – way before Bogdan and Carl arrived. The taxi driver helped us with our bags and then looked at me and said, “So…”. I had a feeling this might happen! Innocently I asked him, “Has nobody paid you?”, he answered “No”, which I interpreted as, “No, of course not, don’t you know that you pay for a taxi at the end of the journey?”. Between Stuart and myself we tried to explain that we had no money and that the guy who ordered the taxi was on his way and would pay him when he arrived… Stuart called Carl to check where they were and was told that they were three minutes away. The taxi driven was NOT happy – he got back in his car and sat, with the door open (presumably to make sure that we didn’t try to make a run for it) waiting to be paid. Three minutes turned into ten, but eventually Bogdan and Carl did arrive and our disgruntled taxi driver received his payment and left. 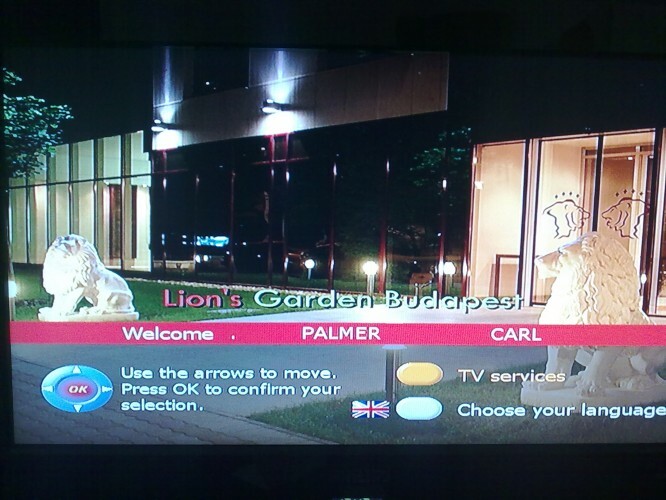 We checked into our hotel – a nice new hotel called ‘Lion’s Garden’ and went up to our rooms where we had just under two hours to chill out before heading to the venue for tonight’s gig. I slept for about 40 minutes then got up, had a shower and did a little practise. At 3.45pm we met Bogdan in the hotel lobby and he took us to the venue (thankfully we didn’t have the same problem with a taxi, as we were able to leave most of our luggage back at the hotel). 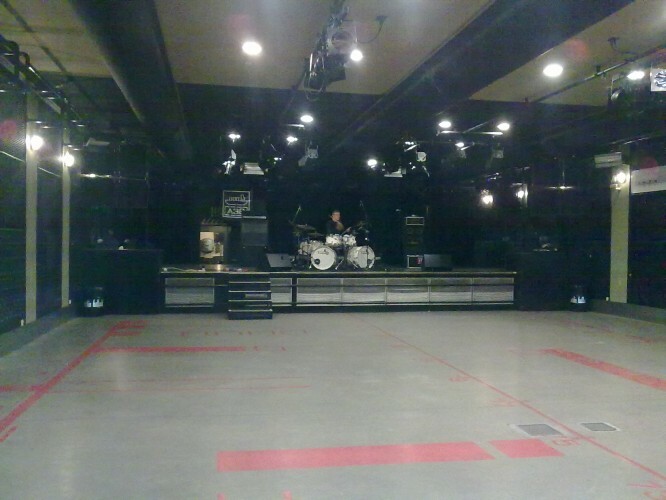 Tonight’s gig was in a venue I’d played several times before with Carl – A38. 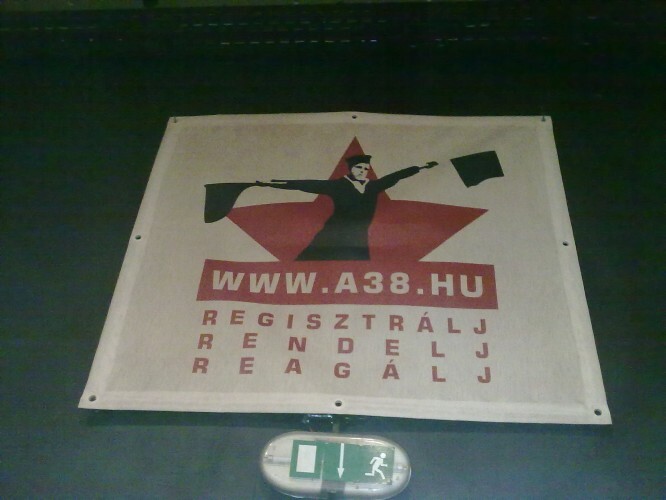 A38 is a ship, moored on the river Danube in the centre of the city. The ship has been converted into a live music venue downstairs and a restaurant upstairs – very cool. 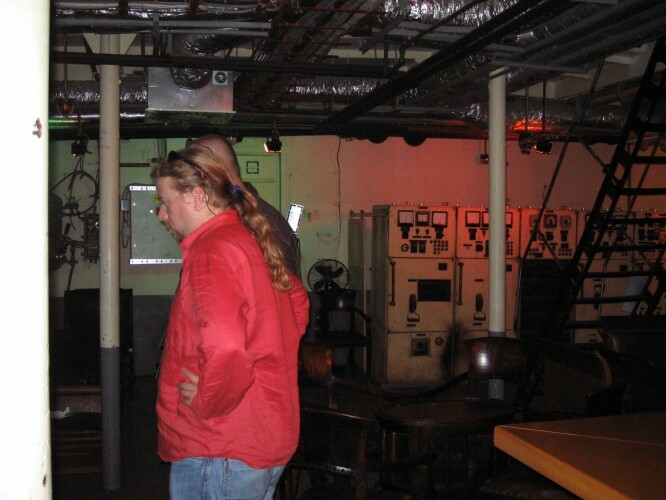 The dressing rooms are the ship’s cabins and the backstage area / bar is the engine room – all of the machinery is still there. Bogdan arranged for us to get some sandwiches and I set about warming up and running a couple of parts from the set then, after a couple of sandwiches, I went to set up my gear. 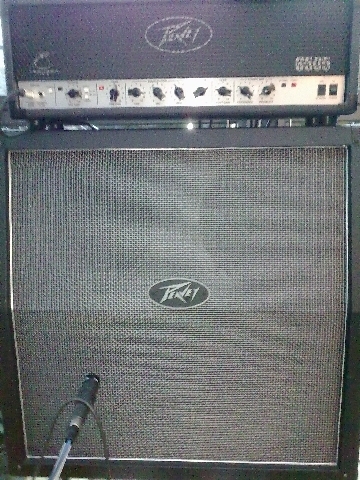 The amp I’d been given was a Peavey 6505. I’d never heard of it before but it seemed to resemble the 5150 – Eddie Van Halen’s signature amp. I set up, re-strung my guitar and waited for Carl to finish sound checking. When it was my turn to make a noise I spent a little time getting to know the amp and trying to get a decent sound out of it; it wasn’t my favourite amp if I’m honest! Then I had to take a little time to set my pedals – the last tour I’d used many of them for was with Neal Morse and so I had to change settings on a few pedals. After I’d managed to fiddle with them for long enough to get the sounds I remembered, I sound checked my guitar. Then it was Stuart’s turn. After Stuart had finished his sound check it was time for us to play together as a band – for the first time in over 8 months! It may amaze people to hear that we would do a gig without a single rehearsal or meeting when we’ve not played together for such a long time, but that’s how this band works! 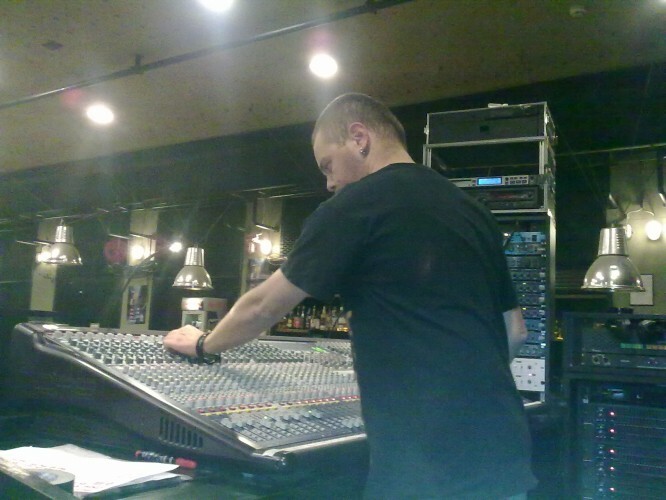 Unfortunately, due to Gabrielli our sound man having to take the van to the garage, we only had time to run a few sections from songs – we didn’t even have chance to run a complete song… and there were a couple of changes to song arrangements that we’d never played before. When we left the stage, after our short sound check, I had the feeling that this was going to be an interesting gig! When the time came for us to hit the stage I was really excited, I couldn’t wait to get out there – I love playing live and it felt like it had been a long time since I’d had the opportunity to. In terms of mistakes, the set could have been a lot better – I think we were all reaching back into our memory banks to recall cues and parts. There were a few places in tunes where one of us came in too early, someone else carried on for too long or missed a cue but, considering that we’d not played together for over 8 months, I think we did quite well! Mistakes aside, I think the vibe of the gig was great. We all had a great time and managed to laugh off our mistakes… well, most of them! I’m glad to say that mishaps weren’t limited to the people on stage – in the sound check we hadn’t had chance to run the intro music for any of our songs. At one point Carl signalled Gabrielli to start the intro to Trilogy – a simple gong sample. It took what seemed like ages for the sample to be played. When eventually it did play I started my slow, atmospheric swell of feedback which takes us into the first theme of the song, only to be interrupted by the trumpet intro of Fanfare for the Common Man blasting through the P.A. – Gabrielli had left the CD running and the next track had started… the audience went crazy as they thought we were about to play Fanfare! I was finding it hilarious and couldn’t stop laughing while Carl frantically signalled and shouted towards the back of the room for Gabrielli to stop the CD. Then Carl insisted that we had the gong intro for Trilogy again… after hearing Fanfare a couple more times as well as the Tarcus intro, Gabrielli eventually found Trilogy and we restarted the tune! After the gig I spoke to a few audience members and they said that they had really enjoyed the concert and felt like they had been part of the show – it seems that our ‘seat of the pants’ spontaneous approach to the gig had really drawn the audience into what was happening on stage (and behind the mixing desk!). I was pleased that they had felt like they’d experienced something unique with us, but I don’t think I’d like to make a habit of giving audiences that experience! After the gig I spent a long time meeting audience members – something I always enjoy doing. Then, once I’d finished packing away my gear, I headed upstairs to the restaurant for the Catfish I’d ordered before the show. After our meal we made our way off the boat and Bogdan explained that he’d ordered another taxi to take me and Stuart to the hotel while he drove Carl and Gabrielli there. Not wanting a repeat of our previous taxi journey, I instructed the taxi driver to follow Bogdan’s car as he was the one with the money! Several red lights later we arrived at our hotel and pulled up behind Bogdan, who promptly paid the taxi driver.